Update interval for they all is 30 seconds. Zabbix server config is default. And the item "agent.version" will never be checked !!! because the key "sleep5" gives timeout. In this moment I enabled the item with the key "agent.version"
The key "agent.version" does not give to become host unavailable after three network errors (UnreachablePeriod=45 seconds). But the key "sleep5" are not marked anyhow with the error state in the GUI. 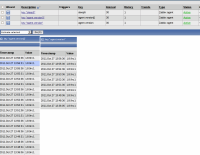 Single place where we can see the reason is zabbix_sever.log and a queue in the GUI. That's too not very good. Server was restarted and the filtered log (debuglevel=4) is attached. I would recommend to redesign this behavior. ZBX-5943 Zabbix treats SNMP noSuchName as "host unavailable"
ZBX-9609 The host is treated as unavailable because of one failed check.